THE LITTLE BLACK BOOK OF SCAMS is a booklet published by the Competition Bureau of Canada. 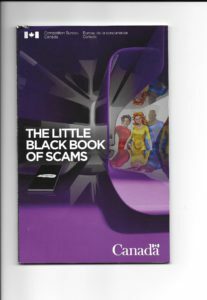 Read it and learn about all the latest scams out there. We are trying to get a supply of these books to have in the office. You can also order the book on-line directly from the Competition Bureau website.